Her old label decided she’s no Lady Gaga, as one listen to Ortega’s lonely, affecting tunes should have told them. When The Killers’ Brandon Flowers visits The Sound Academy Saturday to support his new album Flamingo, he’ll have a local hired hand singing backup that everyone should keep an eye on. 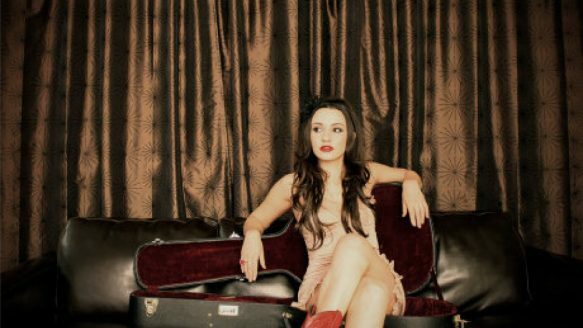 Though raven-haired and ruby-lipped Lindi Ortega will be providing pop harmonies at the Flowers gig, it’s her own unique singing and songwriting take on alt-country that will significantly raise her global profile in 2011, when she releases her new album Little Red Boots in North America, Europe and Australia next summer. Displaying a textured singing vibrato that’s hybrid Dolly Parton and Emmylou Harris — and the integrity implied by each comparison — Ortega mines the high lonesome road of faltered romance in songs like “Dying of Another Broken Heart,” “Little Lie” and “Fall Down Or Fly,” albeit, in some cases, with a twisted smile. “I like to tap into the feelings of loneliness, because I consider myself a loner,” says Ortega, the Pickering-raised only child of an Irish mother and Mexican father. “I spend a lot of time on my own and I like to write songs that reach out to people that are like me in that respect. A bit of a late bloomer in the fact that she didn’t pick up a guitar until she was 16, Ortega’s decade of slogging it out in Toronto clubs and cafés through endless solo gigs — and two albums, 2001’s The Taste of Forbidden Fruit and 2007’s Fall From Grace — finally paid off when she was signed to Cherrytree/Interscope Records, home of Feist and Lady Gaga, in 2008. Things began on a promising note: Ortega released a four-song EP called The Drifterand toured North America, securing opening slots for acts as diverse as Kinks co-founder Ray Davies; Twickenham indie folk band Noah and the Whale; East Sussex alternative rockers Keane, and Academy Award-winning actor-singer Kevin Costner and his Modern West. A full album was recorded, but artist and label parted company before it was released. Ortega was relieved to once again be Indie Lindi, as she’s been called. Since her Interscope departure she’s signed on with her manager Chris Taylor’s label Last Gang Records, and recorded eight new songs with producer Ron Lopata for Little Red Boots, named for the eye-catching footwear she sports during her performances. “I wanted the new record to be a little more ‘rootsy’ and the Interscope version was more pop-oriented,” Ortega notes. Touring the world with Brandon Flowers has given Ortega a new showbiz perspective, allowing her to experience some of her biggest audiences and share some treasured small screen time on such late night TV staples as The Tonight Show and Jimmy Kimmel Live! It’s also her first time on a tour bus. “It’s really cool to see how the big-scale operation works, but at the same time, I think there’s a lot to be said for the low-scale operations of beat-up old vans and staying in seedy motels across the country,” says Ortega. Be the first to comment on "The persistence of Indie Lindi Ortega"